SHOALHAVEN’S own MRTeam motor racing outfit has enjoyed an encouraging race debut at the opening round of the NSW Motor Racing Championships at Sydney’s Eastern Creek Raceway. prepared by their father Terry, achieved their goal of racing in the top third of the field at their first race meeting with the new cars. The Ulladulla based team travelled to Sydney’s Eastern Creek Raceway last weekend to make its racing debut and the professional appearance of the team attracted plenty of attention from the minute the cars were unloaded from their custom built transporter. Commodores when checked at scrutineering. “Race officials were very impressed with the mechanical standard and overall presentation of the vehicles,” Terry said. learn a new look Eastern Creek circuit. Reece started race one from 14th position, while older brother Ryan sat behind him in 16th. the first race with Ryan earning first bragging rights finishing in 10th position, one place ahead of Reece in 11th. The tables were turned in race two when Reece finished 10th, just staying ahead of his brother. the weekend showed why motor racing can be a tricky sport. Taking what they had learned from the two previous races the boys were confident of a strong showing and a top 10 result, but things didn’t go as planned with Reece dropping back to 13th and Ryan unable to finish due to a mechanical failure. “That’s racing,” a philosophical Terry Marchello said after the race. Despite the final race disappointment the boys were happy with their debut race meeting. “We were exactly where we expected to be as we were still settling in to the track each time we went out,” Reece said. “The cars are competitive and consistent, we are really happy with how driveable they are,” added Ryan. Championship to be held at Goulburn’s Wakefield Park circuit April 29-29. Milton Ulladulla Times By CHRIS DOBIE SHOALHAVEN motor racing outfit MRTeam have proven they are serious about their future in the... Read more. Milton Ulladulla Times ON Friday, November 23, MRTeam accompanied the Today - Weather Segment at Sydney Motorsport Park for the... Read more. Milton Ulladulla Times The efforts of local apprentices Ryan and Reece Marchello are nothing short of inspiring, according to the... Read more. South Coast Register SOUTH Coast based V8 racing crew MRTeam enjoyed an exciting and eventful weekend on November 3 and 4 at... Read more. 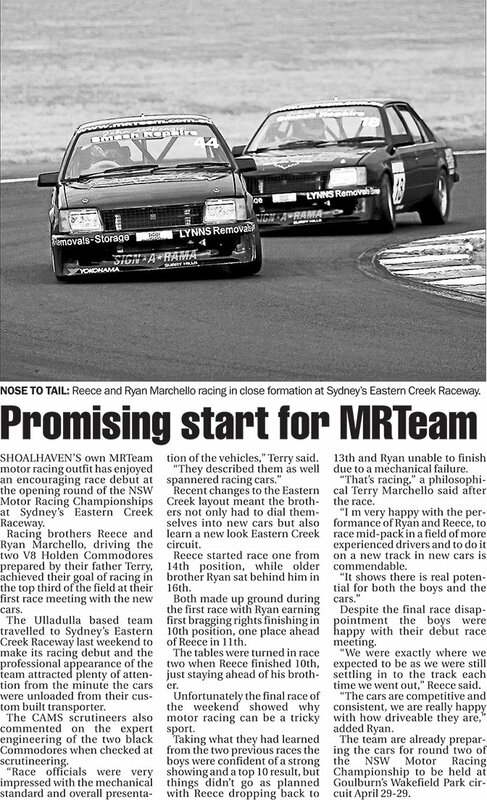 Milton Ulladulla Times MRTeam SOUTH Coast based V8 racing crew MRTeam took part in their final state championship race of the... Read more.